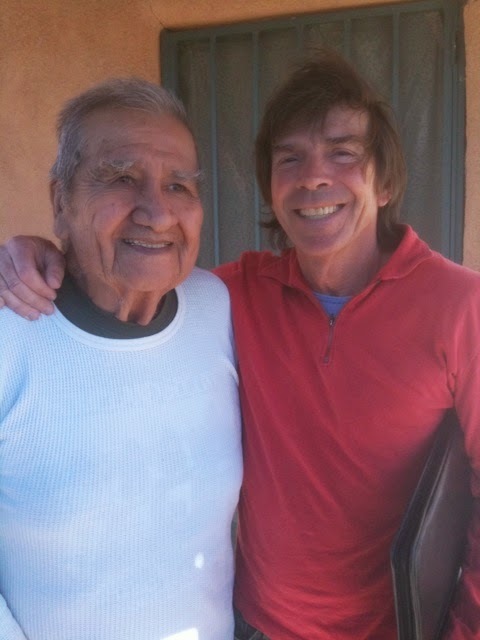 We were saddened to hear the news of the passing of Vidal Aragon on January 5, 2015. 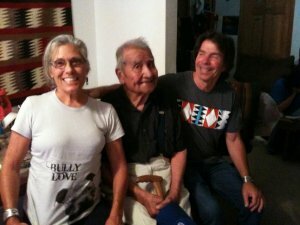 Vidal was an exceptional artist and long-time friend of Four Winds Gallery. 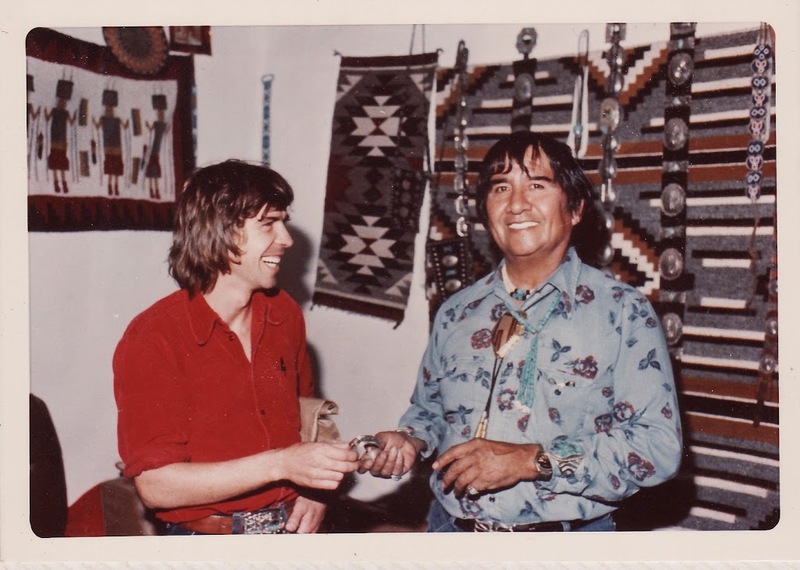 Born in 1923 at Santo Domingo Pueblo, Vidal began his career in the 1930s studying jewelry making at the Santa Fe Indian School. Experimenting with traditional techniques such as tufa casting and lapidary work, he was already highly lauded for his artistry when he began innovating with his soon to be favored craft of silver overlay work. 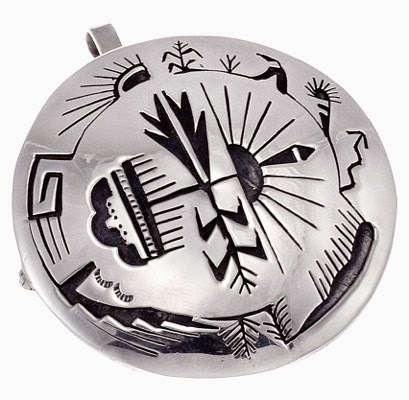 These pieces became famously known as “storyteller” designs. Without using pre-drawn sketches as his guide, his recognizable style features symbolism depicting scenes from traditional Pueblo life, incorporating animals, weather symbols and often a 14k gold sun or moon. A natural and charismatic storyteller himself, Vidal’s ability to communicate transcended beyond spoken words and translated into jewelry in a way that has connected with countless wearers. In 1941, Vidal’s work was featured in the New York Museum of Modern Art. His work has impacted and continues to impact generations of admirers. 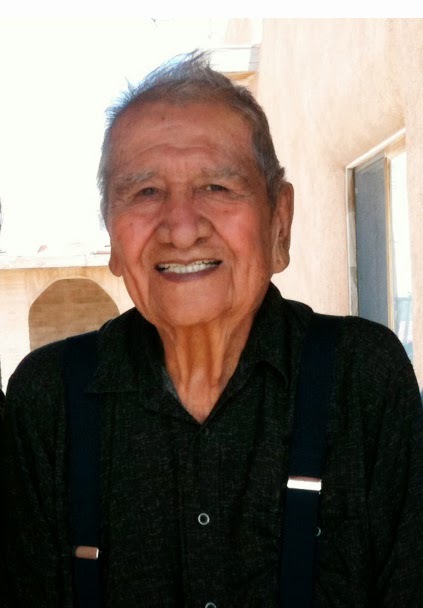 His unique humor and ability to translate stories of Pueblo life still resonates with people throughout the world. Over the years, friends of Four Winds have made Vidal’s storyteller rings their wedding bands, parents have purchased a bracelet for each of their children when they reach a certain age, and his symbols have even been used to create beautiful tattoos. 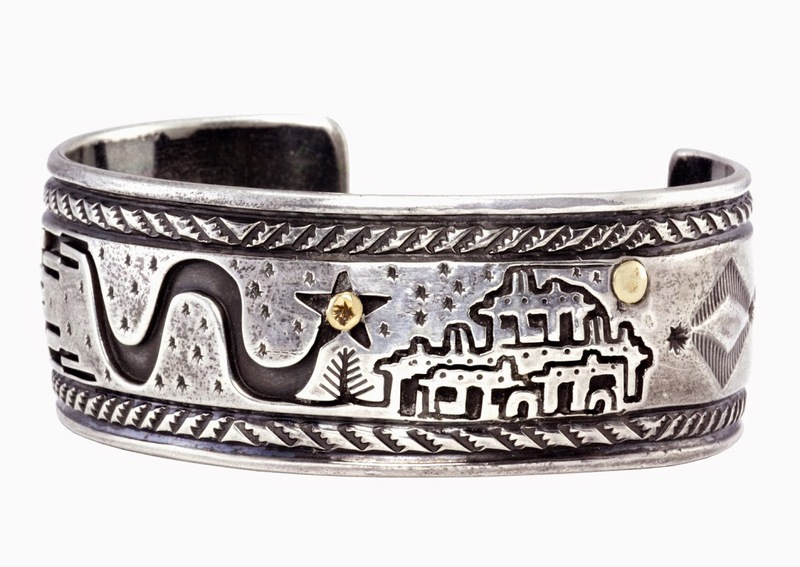 Through his artistry, Vidal was able to share a glimpse of his beloved Santo Domingo Pueblo with the world, where his storyteller jewelry has become a part of individuals’ everyday lives. Although he retired from jewelry making several years before his passing, his work will continue to encourage each wearer to create his or her own stories. You have left a beautiful tribute to a true artist – timeless! 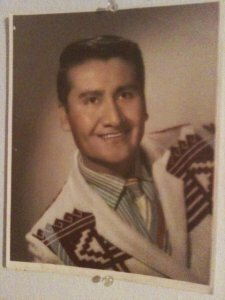 I lived in U.S.A. throughout the 60’s and while there I purchased a long figeral ring in 1965 and have worn it ever since that date – I only found out last year that the maker was Vidal Aragon – and I think of him often when I look at it. I was so pleased to see a picture and details about him as this ring has meant so much to me and I’ve always felt it has strong spiritual vibrations – it’s my prize possession and to this day it is admired by many on a weekly basis. I’m only sorry that I am too late to thank him personally for creating such a beautiful piece of jewelry. In the summer of 1970 I was working as a salesgirl in NYC and a young man came in to make a purchase. He was wearing two beautiful silver bracelets. I asked him about the bracelets and a conversation followed. 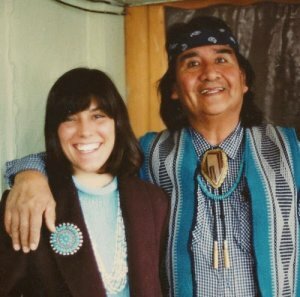 What followed after that was our 23 year relationship, ending only because of Richard's death. 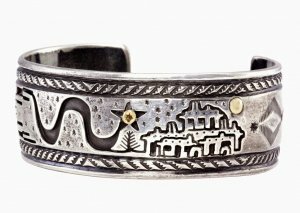 We soon learned that the bracelets, purchased by Richard in a pawn shop, were made by Vidal Aragon at the Santa Domingo Pueblo. 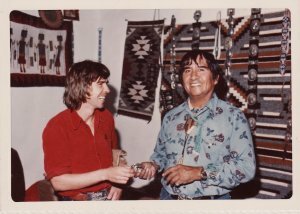 We visited him in the 1970's and purchased wedding rings from Elizabeth McDonald, who owned a shop called Gallery One at that time. 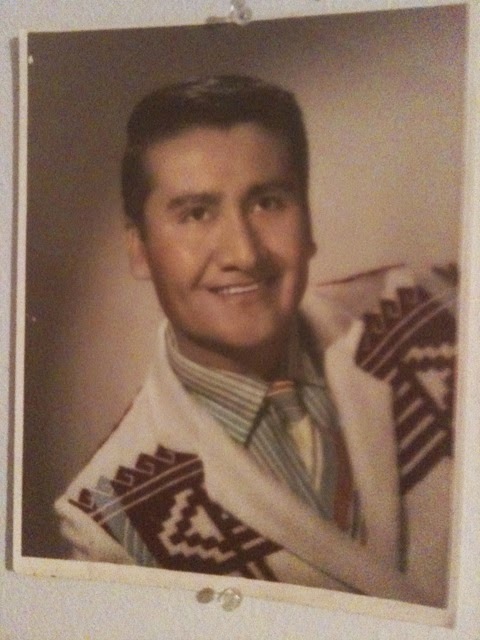 I have subsequently purchased other pieces made by Vidal Aragon and continue to wear one of his rings all of the time. I am so saddened to hear of his passing. Thank you for sharing this information. I have a beautiful story ring with a coyote by Vidal Aragon and will continue to treasure it. Nancy from Corvallis, Oregon.